Yak is an overeager kid. In junior, that trait combined with blazing speed, meant he could play 100 mile/hour and produce doing it. Unfortunately, in the NHL, there are lots of players who can cover that speed, and more. As he matures, some of that eagerness will go away. He’ll learn when to turn it on and when to slow the game down. Similar to the maturation that Hall has gone through in adjusting his style. Yak’s got a great fastball. He needs to work on his change. 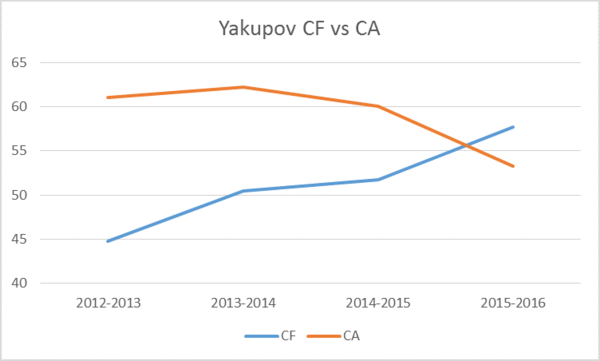 People also need to remember that was a terribly weak draft year and none of the other top picks from that year are in a much better boat than Yak. Gally in Montreal is as much of a polarizing player there as Yak is here, Murray’s okay but not exactly knocking anyone’s socks off as a #2 overall d-man, etc. 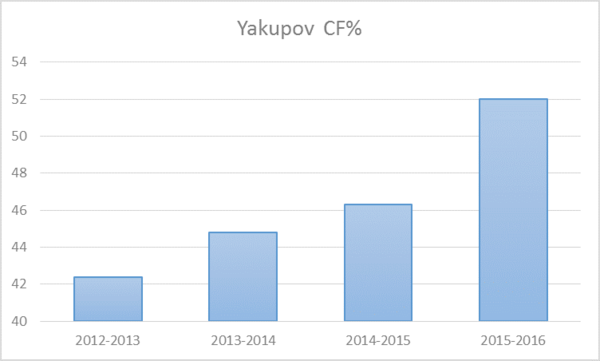 If he continues to grow as he has this year, Yak may yet well end up being the best of them. Would be nice to see him “fit in”on a line for a lengthly period and be comfortable and gain some confidence,a credit to the coaches and to him .Kinda jobbed from the very beginning various coaches and critics this year looked like it was finally going to work out then fluke injury to him and to MacD forces a re-load yet again,give him Credit could have given up but didnt.Good on you Yak Keep on doing your thing. Yak always plays hard, he always seems to be the odd man out when there are too many right wingers. I really think that by the end of this season, either Yak or Eberle won’t be on this team. He is still,finding his way and never gives up. Like many fans, I hope he lites it up when McDavid gets back , he has had to put up with way too many haters. Love Yak and his energy. I dream that Yak develops into a player who combines the best of Ovechkin and the best of Datsyuk into a new hybrid Rocket-Richard-Frank-Selke double-double winner. I like Yak. I cheer for him and he does, to my eye, seem to be doing better this year. Frustrations are that he misses the net too much and this year he seems to be on a Corsi Crusade. He’s taking more shots from bad areas. I guess the flip side of that is that it’s better he’s taking shots than not. He’s going to be fine. Apparent great attitude. People have to get over that he was a #1 pick and go with what he is and will be. It’s the Horcoff syndrome. Excellent post, Mr. Kassian. Simple for guys like me to understand, clear, and for us old farts, a Dragnet quote – “just the facts, m’am”. Yak has heart and hustle, just like every kid that loves hockey. Oil fans should be celebrating that. Long term he could be a sleeper Oiler favourite. His late goal the other night (Dallas, IIRC) made it 3-2, quick release from the left circle, that is his destiny. Anticipation, quick release…he and McD gel for that reason (yes, McD and almost everyone else will gel too, but not Hall as we have seen).